At 16:45 UTC in the afternoon of September 15, the small town of Carancas in Provincia Chucuito, Peru, was shaken by an enormous detonation. Eye wittnesses described a smoke trail that had descended from the sky and had exploded on contact with the ground. Windows were shattered and buildings damaged by ejected secondary debris. A mushroom shaped explosion cloud raised from the impact site and stood several minutes above the fresh Meteorite impact crater. At 16:45 UTC in the afternoon of September 15, the small town of Carancas in Provincia Chucuito, Peru, was shaken by an enormous detonation. Eye wittnesses described a smoke trail that had descended from the sky and had exploded on contact with the ground. Windows were shattered and buildings damaged by ejected secondary debris. A mushroom shaped explosion cloud raised from the impact site and stood several minutes above the fresh crater. At the same time in the city of Puno, the Peruvian seismological network recorded a slight earthquake with an energetic equivalent of 17 gigajoule or four tons of TNT. The explosion caused a crater with a surrounding wall 13.8 meters in diameter and almost 6 meters deep that soon filled with ground water. 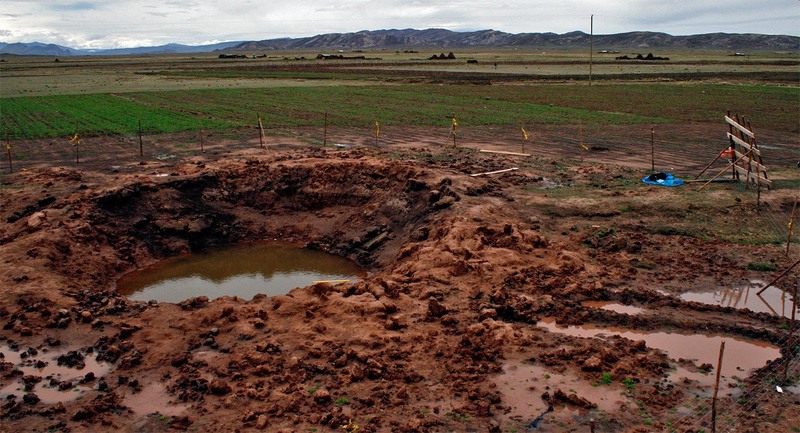 Bubbles that appeared on the surface as the water filled into shock fractures of the ground led to the assumption the water was “boiling” from the heat of the impactor. The northern crater wall was higher than the southern and reached a height of 1 m above the original ground level. Ejecta material was found up to 100 m from the crater. 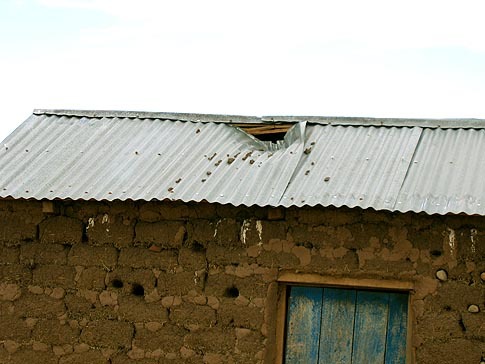 Reports of a myterious sickness among the inhabitants of the area that followed the impact were spread in the news and led to the assumption that the Carancas impactor may have been contaminated by toxic substances. However, it soon became clear that the reports on the sickening effects of the event were largely exaggerated and that the single cases of illness that actually ocurred were triggered by the high ammounts of sulphur vapors that had emitted from the ground water. Soon after the impact, local residents recovered numerous pieces of the impactor from the ejecta blanket and the sides of the crater. The 27.20 g sample pictured above was collected only few days after the event by Jan Hattenbach, who also documented the crater in photo and provided a thorough account of the event that was later published in the German astronomical periodical “Sterne und Weltraum” (Stars & Space) (12/2007). The meteorite fragment is now part of the Buhl Meteorite Collection with the inventory number B-203. 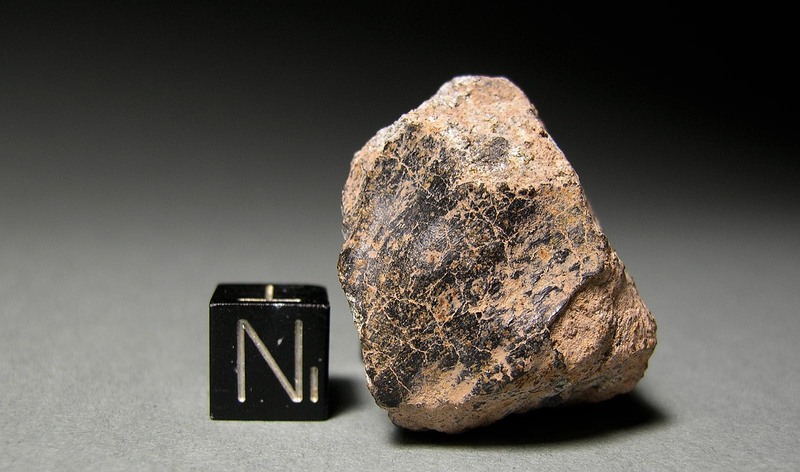 Pictured below is a 350 g fragment, one of the largest recovered. Most of the recovered samples were in size from dust grains to a few grams. The image of the 350 g specimen was kindly provided by Erwin R. of www.bolivia-minerals.com. Among other experts who arrived early at the scene was US professional meteorite hunter Mike Farmer. Farmer purchased samples of the impactor (some of which directly from local police representatives), of which he donated many to scientific institutions for analysis and classification purposes. On 5 October 2007, the Lunar and Planetary Laboratory of the University of Arizona published their results. According to their report, most specimens collected are without fusion crust and have a grey color with some metal and chondrules visible, although the chondrules are not easily observed. At least one specimen had two different lithologies, grey and white in color, indicating it is a breccia. Numerous, black shock veins, often on more than one face of a specimen, were observed. At least one large (~2 cm) metal piece was also recovered, with a thin layer of stone attached to it. The thin section analyzed showed the rock to have experienced extensive recrystallization of the matrix with few relict chondrules present. Relict chondrules range in size from ~170 µm to 1 mm. Olivine and orthopyroxene were observed with abundant Fe, Ni-metal and Fe-rich sulfide. 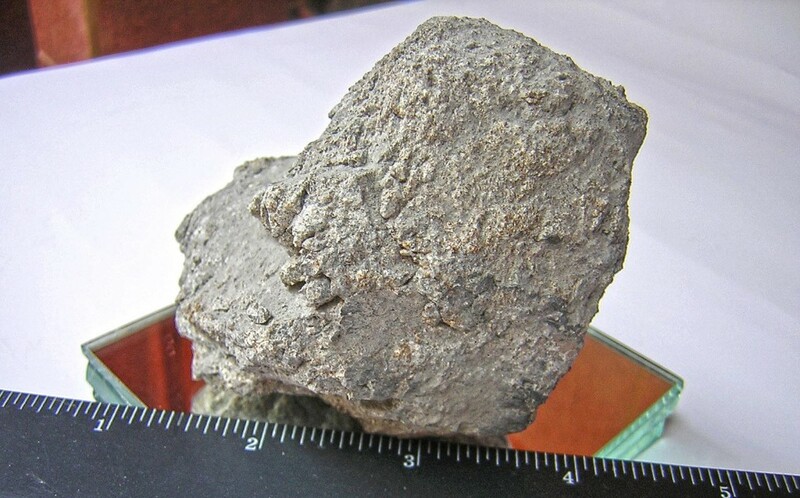 The Carancas Meteorite was classified as an H4-5 type ordinary chondrite.